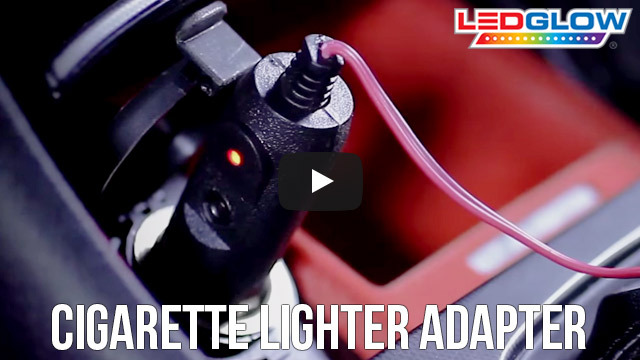 LEDGlow’s Cigarette Lighter Power Adapter allows you to easily power any of our LED lighting kits directly from your vehicle’s cigarette lighter receptacle. LEDGlow’s Cigarette Lighter Power Adapter easily plugs into your car or truck’s cigarette lighter. The adapter also includes wire connectors which attach to your lighting kit or 12 volt accessory. These connectors have a quick crimping feature that works great with your lighting kits, allowing you to easily hook up the power and ground wires from your kit. After making these easy connections, all you need to do is plug it in. Today’s car cigarette lighter adapters and truck cigarette lighter adapters also take the form of a cigarette lighter adapter plug. But with a traditional cigarette lighter and LEDGlow’s power adapter, the process couldn’t be any easier! Each LEDGlow Installation Accessory also includes a one-year limited warranty as well as free lifetime technical support. I purchased the lights along with the cigarette adapter and they work great. A variety of vivid colors! I ordered this and the expandable circuit not sure which option I’d use. Although I went with the expandable circuit, this product is nice and will be very useful for another application at some point. It did use it temporarily to test the lighting kit prior to installing under and in the car. It worked great and would work great as a permanent installation. 3m tape sticks awesome. Lights are brought and work as advertised. Just be advised you need to buy the cigarette lighter adapter separately. Easy to set up and use. Working well so far.